A Tegra 3 quad-core processor makes everything from speed and engine revs to 3D Google Earth map views show up in real time. The 2016 Audi TT’s engine is turbocharged, and so is the graphics on its new, all-digital ‘virtual cockpit’ instrument cluster. 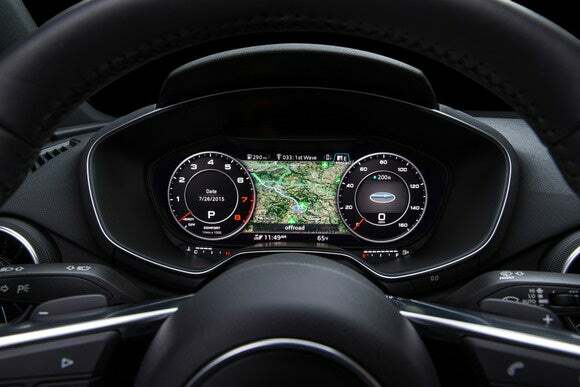 We’re talking 60fps, the speed PC gamers seek from their monitors—and the speed automakers need on displays to show tachometer, speedometer, and map data in real time. Nvidia knows a thing or two about delivering that kind of speed. In this case, a Tegra 3 system on a chip (SoC), with dedicated processors for video, sound, and imaging, is the roaring beast in the Visual Computing Module (VCM), which drives the 12.3-inch, 1440x540-pixel ‘virtual cockpit’ display in the TT. In another parallel to PC gaming hardware, the VCM is upgradeable. Audi will be able to swap out the component, so you needn’t be stuck with the same old graphics technology for the life of your car. This is just one example of how Nvidia is taking its GPU power into automobiles. Its chips are already in the Tesla Model S and other cars, and they’re processing sensor, camera and other data streams as well as powering displays. These chips are automotive-grade, too—built to withstand heat and motion stresses that would make your liquid-cooled gaming rig beg for mercy. 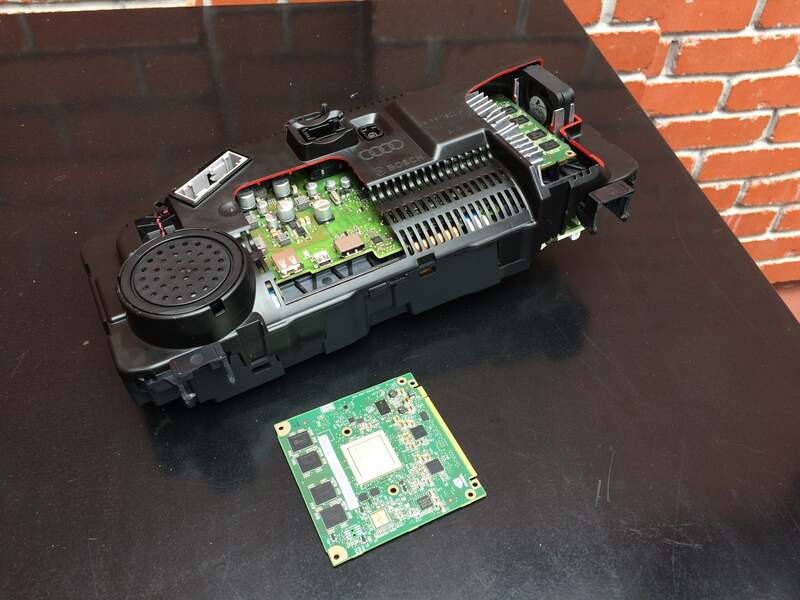 This rear view of the 2016 Audi TT’s virtual cockpit module shows some of the circuitry behind the 12.3-inch TFT display, while Nvidia’s Visual Computing Module sits nearby. There are actually two Nvidia VCMs in there. A second module drives the navigation system. 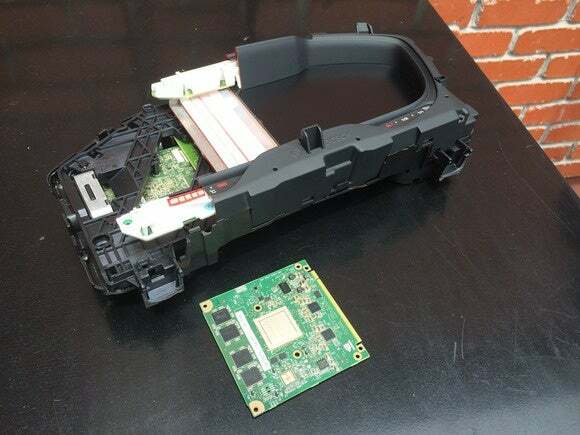 This photo of the user-facing side of the module (the part that would show in the dashboard) shows a crosscut through the display layers down to the computer guts. This cross-cut of the 2016 Audi TT’s virtual cockpit module (front view) provides a peek at the compuer behind the display layer. Nvidia’s Visual Computing Module sits nearby. Driving purists may dismiss the virtual cockpit as a gimmick and stick with its ‘Classic’ view, where the tachometer and speedometer dominate the display. The 2016 Audi TT’s ‘virtual cockpit’ in classic view, with tachometer and speedometer at the forefront and map data in the center. Once they play with switching among the variety of ‘classic’ and ‘infotainment’ modes, however, they could enjoy the choices. When you reach cruising speed, for instance, you can switch to one of the ‘Infotainment’ views, where the meters cede more space to map, weather, or other travel or entertainment data. The images above and below show the same map, but with the tachometer and speedometer dominating in Classic view (above), and a broader map view dominating in Infotainment view (below). The 2016 Audi TT’s ‘virtual cockpit’ in a navigation view, with mapping data in the center and smaller tachometer and speedometer on either side. The navigation is especially good. It uses data from the Here mapping and locations service, enhanced with a Google Earth overlay for accurate, almost lifelike representation of what’s ahead. 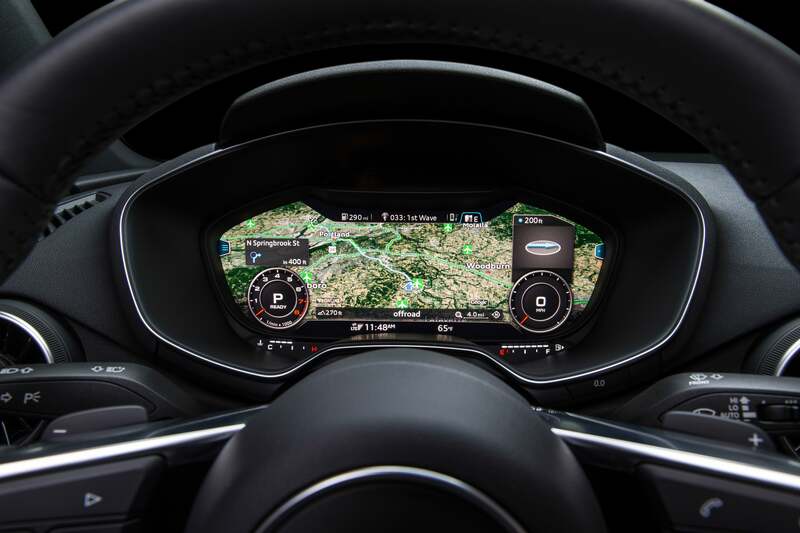 Mapping data is important for high-tech driving: Audi is part of an automotive consortium that just purchased Here from Nokia for $3.1B. The 2016 Audi TT will be the first car with the virtual cockpit, but Audi plans to build it into other cars in the near future: The R8, plus the A4 and the Q7. Stay tuned for our eyes-on experience with the virtual cockpit when the TT ships later this summer.